Anne & Paul opened us with a question that put the book in an unexpectedly harsh light: "Who would you recommend it to?" That put the majority of the group (myself included) in the odd position of having not hated the book, perhaps even having enjoyed it, yet realizing that we would not, in fact, suggest it to anyone else. In a nutshell: it's too weird for people who don't read weird, not science fictionally/fantastically interesting enough for genre readers. Also, it's written slightly in this Austenite/steampunk/pseudo-Victorian vein, and again, too much so for non-fans, not enough so for enthusiasts. However, a few at the group have already gone on to the next book in the series (three already out; supposedly at least seven planned in total), so it may be one of those things where the series as a whole redeems itself above a single entry. "A Natural History of Dragons" introduces us to a whole new fantasy world, one which is only lightly sketched in for us. It's not Earth--different continent structure, presence of dragons--but it's hard to say too much about it. Refreshingly, there does seem to be truth in advertising in the "natural"; there's no hard evidence of magic or the supernatural yet, and while we don't see nearly enough of the dragons, the assumption seems to be that they operate by natural (albeit novel) biology. 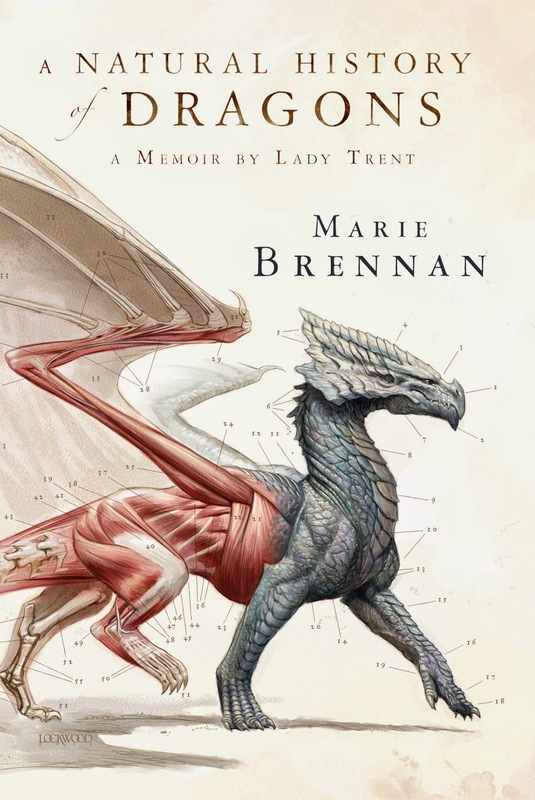 Our memoirist, Lady Trent, is recounting her early entry into the natural sciences and an expedition to study dragons that turns into rather more of a bit of a mild cloak-and-dagger political tale (Paul described a good chunk of the action quite rightly as a "Scooby Doo Mystery") than anything concerned with scientific exploration. Let me say again, we don't see nearly enough dragons. They don't actually appear on screen that much; it's posited that they're natural creatures, part of ecosystems, and with some fairly complex behaviors; but we don't see them. Perhaps it deserves a pass because there are a few illustrations, but I was flabbergasted even by how little the dragons are described from the very beginning--Brennan seems to assume we know what her dragons look like, ignoring the fact that there are many traditions of dragons we could be pulling on. I know I'm a bit outside the norm on this, but I really enjoy "naturalist" writing; world-building is one of the reasons I read, and often what I enjoy most in a work. (This CNSC discussion caused me to commit even more to my position that "plot is the least interesting thing" that I first started thinking about clearly in the YA discussion prompted by Think Galactic's "Wizard of Earthsea" meeting.) Furthermore, the kind of early scientific endeavors that are clearly being used as a rough model here are really rich and interesting--the Royal Society, for instance, or the travels, journals, and theorizing of Darwin, Wallace, or others. Sadly, Brennan isn't doing more than giving that form a vague nod while following her own plot: the Mystery Machine, far more than the Beagle, is the spirit vehicle of this novel. This is a comparison I have been longing to make, actually. The group consensus: MORE DRAGONS, PLEASE. I was so starving for some creative dragon biology that I just pounced on the crumbs that are here--the hinged-scale wings, for instance. The potential to do some satisfying plausibility-creation here is a steep challenge, but could be intensely rewarding. Dragons don't work for me in most fantasy precisely because they're so difficult from a realistic perspective. (Well, clarification: they don't work for me where the world is otherwise presented as naturalistic. Where the world is overtly magical, or where the tale is told in a certain high/mythic fashion, than the mundane rules are relaxed anyway and it doesn't bother me.) Even ignoring magic/fire/intelligence-with-that-braincase-lol, the basic problem is FLIGHT. And weight. At that size. Plus of course the history of a 6-limbed vertebrate, implying a class of chordates distinct from all other land animals. Metabolic needs. And so on. All of which I AM SO INTO if it's being done in a realist/naturalist rather than hand-waving way. But so far, Lady Trent hasn't taken me very far in that direction. I admit I'm tempted to keep reading just for the possibility. Likewise, we're fairly clearly meant to read this as "Victorian England", but it's definitely not really that, in-world, and the hints of strangeness--the calendar, the religion--aren't followed up on enough. Fleshing out the cultures and world could ground these stories and make them interesting, but I fear that it won't happen because this is just "pseudo-Victorian, but with dragons", and that won't really hold up to any deep weirdness, that being a very specific Earthly time-and-place being evoked. We talked quite a bit about how the framing works/doesn't work. I found it jarring that the story is told with BOTH as-it's-happening-minutiae and also comments-from-decades-later-when-I'm-writing-this-memoir. Keeping the memoirish comments separate from the action would have been a lot more believable/fluid. A number of readers pointed out that she's not "Lady Trent" by the end of this book, nor apparently by the end of the next, and we're giving the series a bit of a side-look for relying so heavily on that eventual situation without making noticeable progress that direction (I believe "How I Met Your Mother" [2005-2014] was the comparison). The lack of visible women generally in this world, and whether that's excusable given the society itself or not. The Pluck Factor (pluckiness of protagonist being something CNSC is putting a firm cap on). It was decided that Isabella falls within acceptable parameters of the Pluck Factor, and comes across as more geeky/scientifically curious. Furthermore, she shows no indication of being The Chosen One, so that's good. The parallels between this novel and Robin Hobb's "Dragon Keeper" (2009) (which the Blackstone FSF discussed) are pretty strong. Pseudo-Victorian re/opressed scholar-woman studying dragons. Although Brennan's was a lot more enjoyably written, "Dragon Keeper" had more for me to think about, I think. All in all, while I guess we can't recommend "A Natural History of Dragons"...there may be hope for the series as a whole? Will mention if I hear to that effect. Next month's pick for CNSC is Connie Willis's 1997 time-travel comic romp (and Hugo/Locus winner) "To Say Nothing of the Dog".